Warlike appearance in the ceremony for troops protecting major events, the special armored vehicle Hummer H2 Police made many people admire. 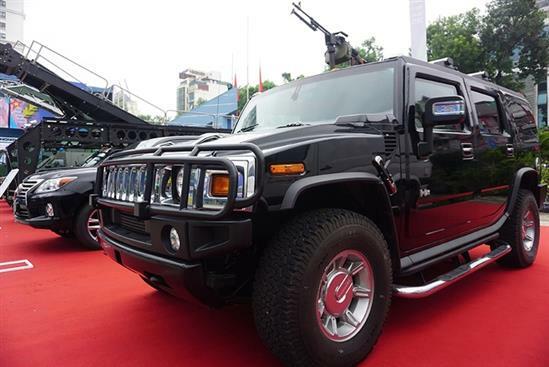 However, not until 70 years Exhibition of Economic Achievements – Social at Giang Vo Exhibition (Hanoi) in September 2015, when the Ministry of Public Security formally introduced the new car lovers admire conditional access scene, even caress the contours of healthy “athletes” armored special Hummer H2.It is known, according to mission requirements, the Ministry of Public Security has ordered a number of armored vehicles armoring International company dedicated from the famous American Corporation. These cars were “high” resistance to bullets on wild chassis Vietnam multipurpose vehicles Hummer H2 by General Motors (US) production.From the base vehicle, armoring International Corporation undertook the upgrade, turn the Hummer H2 into a special bulletproof vehicle as required by the Vietnam Ministry of Public Security to use for tasks such as riot, anti-terrorism and VIP protection when necessary. According to the basic parameters of the board of the Ministry of Public Security introduced at the exhibition of the “athlete” has the ability to level B6 bulletproof European standard (equivalent to the American standard NIJ 3). Ie it can withstand such powerful ammunition 7.62×39, 5.56×45, 7.62×51, M193, and M80 is often used on the AK-47 rifles, AK-103 and was manufactured by International Armoring Corp. in Utah, USA. In addition, it also can resist bullets and splinters, landmines yield assorted size 8-10kg of TNT at a distance of several meters. It is known that the highest standard of bulletproof Europe is B7, equivalent to 4 US NIJ standard. Although more than 3 tons heavy, but thanks to the V8 engine cylinder capacity of 6.2 liters Powerful largest nominal capacity of up to 393 hp with maximum torque of 415ft-lbs at 4500 rpm rev / min, Hummer H2-Lux likely obstacle 508mm high and 1.016mm deep wading; the vehicle can climb slopes with a gradient of 60% and reached a maximum speed of 190km / h.
However, armoring Corporation International also revealed further that the entire area of the vehicle passenger compartment is armored and light composite material is resistant to bullets. The entire original car glass has been removed, replaced by bulletproof glass equivalent standards of vehicle armor steel. Stores and chassis are reinforced with steel grades and lightweight composite materials. In addition, areas such as fuel tanks, batteries, and computer center were armored side panels protect the surrounding steel radiator front engine. Naturally, tire type run-flat luxury vehicles ensure maintaining high speeds even when punctured but still easily playable. 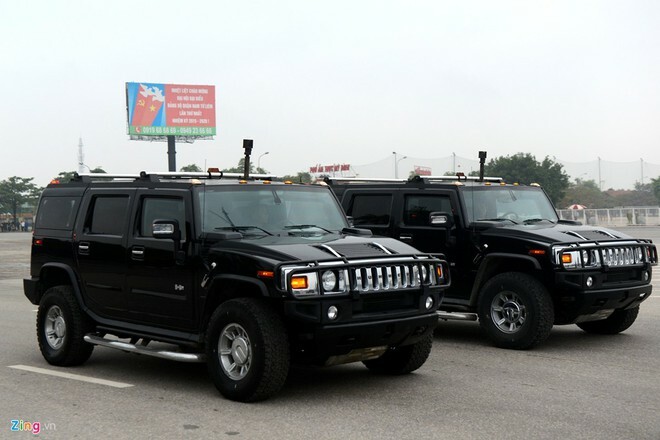 According to International Armoring Corporation, armored cars special Hummer H2 has the standard equipment such as air conditioning completely automated, central locking, cruise control, electric heated seats, windows location, interior premium leather and positioning navigation system, parking sensors and power steering systems. Of course, we still maintain the ability to run extremely well Wildlife Vietnam’s due original Hummer H2 4WD system full time with differential lock. With middle-venture gun mounted on the roof PKM, with a crew fighting intense firepower. Known PKM is supporting weapons fire powerful, easy to use and reliable to equip the detachment level motorized infantry against infantry force and pressure processing personal weapon firepower of their opponents. 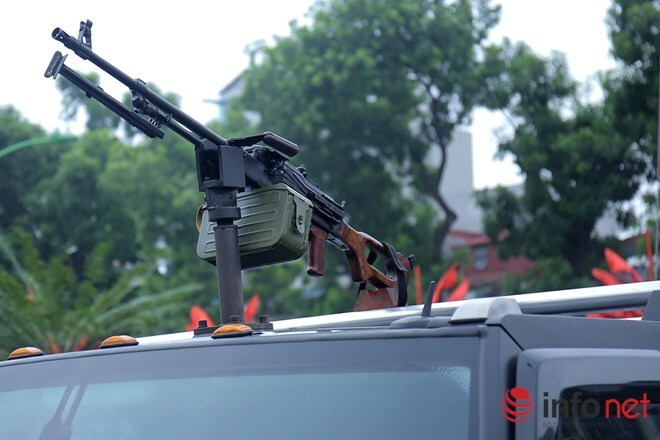 PKM machine gun on the roof of special armored Hummer H2. Photo Infonet. They are improved from Kalashnikov PK machine gun type of world famous with the perfect combination between the fire of machine guns and lightweight portability of the machine gun, can fire ammunition loaded 7,62x54mm size from ammunition belt contained in the box next to the bullet had the 100, 200 or 250 members. See original story translated here.